Jill was inspired to rekindled her love of art when her first grandchild was born. Desirous of capturing an enduring image of him she was delighted with the results and so started her artistic journey. Since then she continues her fascination with portraiture but also has created pieces as diverse as a rainbow of miniature origami birds and a 10 ft tall sculpture. 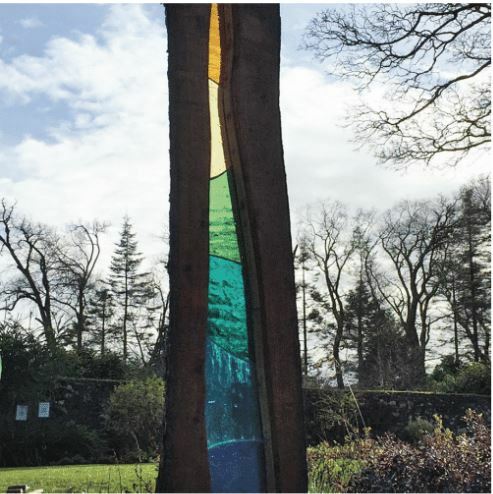 ​Jill was Artist in Residence at the Sayle Gallery, 2014, and last autumn she was invited to exhibit six pieces, created with stained glass and wood, at Harlow Carr, RHS Gardens in Harrogate. Jill loves the complementary contrasts between the colourful, light enhanced glass and the timeless solidity of wood. Her latest piece (the 10ft tall one) is currently available to view in the Milntown Gardens, Ramsey.